Disney dropped a bombshell on everyone during Thanksgiving when they revealed the first trailer for their upcoming remake of The Lion King. While many were ecstatic to see these beloved characters brought to life in the first visually stunning footage, there were those who also expressed some concern. Those concerns have to do with the fact that, at least the first trailer, is a shot-for-shot remake of the 90s animated classic. 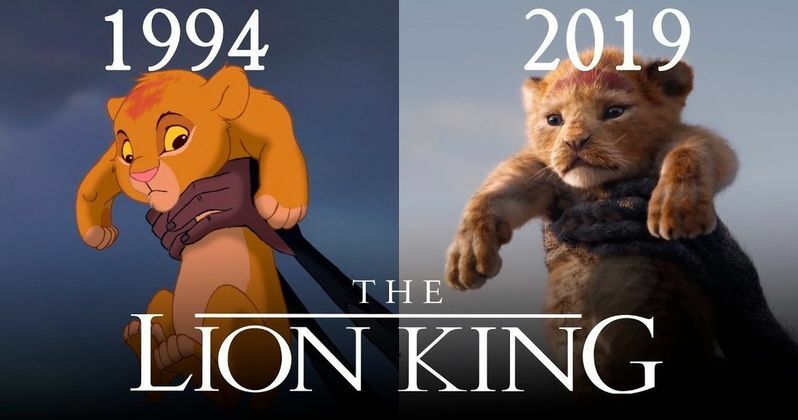 This is exemplified in a new video that has been making the rounds, which compares the footage from the new Lion King trailer to the 2D animated version of Disney's original The Lion King from 1994. The similarities are more than coincidental, as director Jon Favreau has assembled a miraculously near-identical series of shots that line up perfectly with the original. The shot of Pride Rock, Rafiki christening a newborn Simba, and the famous shot of Simba being held up for all of the kingdom to see. It's all there. At first glance, this isn't so much going to be a reimagining as it is going to be a very straightforward remake with very advanced CGI, as opposed to more traditional animation. Even those who may feel uneasy about the idea of The Lion King being remade shot-for-shot can admit that what Disney has cooked up is visually impressive. What's interesting to note though is that this is largely being referred to as a live-action remake. In reality, it's all CGI animation, meaning it's not live-action at all. It just looks that way because the same groundbreaking technology used for the recent remake of The Jungle Book is being employed to bring these characters to life for a new generation. In fairness, it's quite possible that this first trailer was just intended to recall familiar imagery that will be employed in the remake for the purposes of giving people a rush of nostalgia. It hasn't necessarily been confirmed that the entire movie will be a complete, unchanged remake. Disney has been remaking quite a few of their animated classics and, while the stories often closely mirror what came before, they have changed things up enough to justify the new version of the movie. The Lion King is about as beloved as classics come and they could be treading on dangerous ground if they are brave enough to make the whole movie like this trailer. Be that as it may, this is positioned to be one of the biggest blockbusters of next summer. Additionally, Disney also has remakes of Dumbo (March 2019) and Aladdin (May 2019) set to arrive before The Lion King arrives in theaters on July 19, 2019. The cast includes Donald Glover (Simba) Beyonce (Nala), Chiwetel Ejiofor (Scar), John Kani (Rafiki), John Oliver (Zazu), Seth Rogen (Pumba), Billy Eichner (Timone), Alfre Woodard (Sarabi), Keegan-Michael Key (Kamari), Eric Andre (Azizi) and Florence Kasumba (Shenzi), with James Earl Jones returning as Mufasa. Be sure to check out the video from the Lights, Camera, Pod Twitter account below.